Hey that 4.8is wouldn't happen to have DI-NOC in carbon fiber over the wood trim would it? No. The trim inside is pristine. 83k miles. Ok lol... We loved our 4.8is... Luxury, performance and that color!... But after 20k in repairs we had to say goodbye. We still miss it a lot. Out of all the BMWs we've had over the years, That was our favorite. I would like to hear about any transmission repairs followers have had. Bought my 4.6 new so know entire history. Replaced the temp sensor at 117,000 miles. Changed fluid and filter every 50,000 miles with ZF products. Last edited by bcredliner; 12-01-2017 at 02:52 PM. I can chime in on my old 4.6is that i recently sold a few months ago. I did change transmission fluid and filter with ZF products and still experienced 2-1 downshift jerk when the vehicle got to normal operating temperature. Sport mode sometimes yielded a better experience. Even resetting and upgrading transmission software did not cure the issue. I did not dig any further. There is no mention of you. This is a completely different thread. I am interested in the responses of the owners using the same criteria I posted. Would be great if you reposted it as a list of all the criteria/factors as I did. Won't prove anything but should be interesting. I can tell you this, my 4.8iS with the 6 speed automatic had never had it's gearbox fluid changed by the previous (first) owner. It was shifting but not great when I bought it (81,427 miles) . Shortly after having the fluid changed, it started flaring and banging into gear setting off the trans fail safe message. After replacing the Valve Body and solenoids, it shifts like a new car. *let it be said I never had a harsh 2-1 downshift. Hi all. New to this forum and looking for your insight. 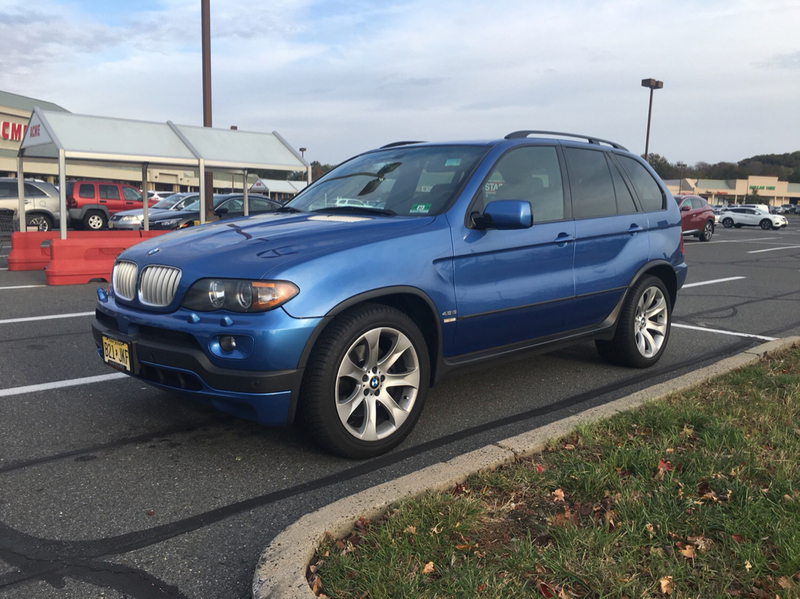 I have a 2003 E53 X5 4.6iS with 65,6xx miles on it. Estoril Blue with Alcantra interior. I am the second owner (original owner was a family friend) and both of us have maintained her meticulously. Recently had its 60,000 miles check-up, new brakes, new tires and full detail. Car is in great condition with no maintenance needed to my knowledge. Thinking of selling and curious of what a fair price would be? I have read several forums/blogs and unable to find one with such low mileage to compare. Thanks in advance. P.S. I only have this one photo on my phone.. can take more if anyone is interested. If you do want to sell, you might want to to something to the headlights as they do not scream meticulously maintained low mileage car. As for the price, after 15 years, I don't really give any value to mileage on a car and certainly not low mileage as all rubber parts and gaskets have an age component in their durability. You might be able to get a small premium if your car is truly flawless but the headlights are not a good sign.